I’ve been drawing for decades. 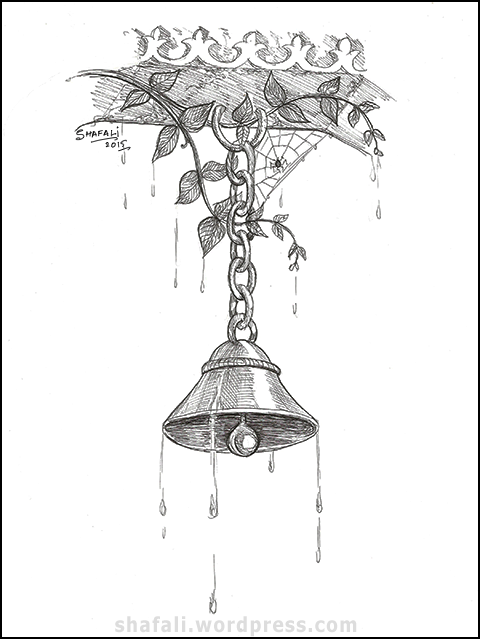 My earliest memories of drawing are from Kashmir. I was five. We lived in Ramban on the bank of river Chenab. In mornings, my mother would give me a bath, comb my hair, hand me a slate and sit me out in the porch so that I could get some sun. I could see the violently white waters of Chenab beating against the rocks that glistened as they reflected the morning light behind the green front yard that stretched between me and the river. I’m sure if the house was any closer to Chenab than it was, my mother wouldn’t leave me on the porch alone. So that’s where my artistic journey began – in a land that’s today torn by politics, terrorism, and separatism. The land that in my hazy memories is still the most beautiful place that I’ve ever lived in. But I began this post with an Oscar Wilde quote, and I shouldn’t stray too far from what I intended saying. I’ve been painting. Not caricatures, nor portraits – but I’ve been painting my consciousness. I don’t classify my art, mostly because I can’t. How do you classify a vision, a half-dream, a sub-conscious feeling so strong that it takes me by my spine and shakes me up…? I don’t know if an artist can express everything – but as an artist, I attempt to capture those fleeting moments that scream with emotions. The violence of these moments, like the violence of Chenab, froths white and blue and red – and to express it, I need not just lines but colors – and so I sketch fast…the madness of those first sketches is so complete that the painting competes with the sketches to express it all… if it does it at all. The galleries have long waitlists and it would be at least an year before my paintings are exhibited – until them, I remain their captive creator… until then, I also remain your absentee blogger, whose mind and heart never see eye to eye – but then whose does? Hats Women Wear: Portraits my Heart Painted. I am painting the fourth portrait now. I started at 2 in the morning. I love these hats because I paint them for the creator who lives inside me. Each of these hats is special because they lack design. I haven’t attempted to channel or even hide the chaos. Each of these has evolved organically. Usually I start an artwork with a sketch then paint over it. I do this more out of need, I’d say; when you illustrate for a publication, there’s a review process that entails an approval on the sketch. The hat-paintings are all done without a supporting sketch. 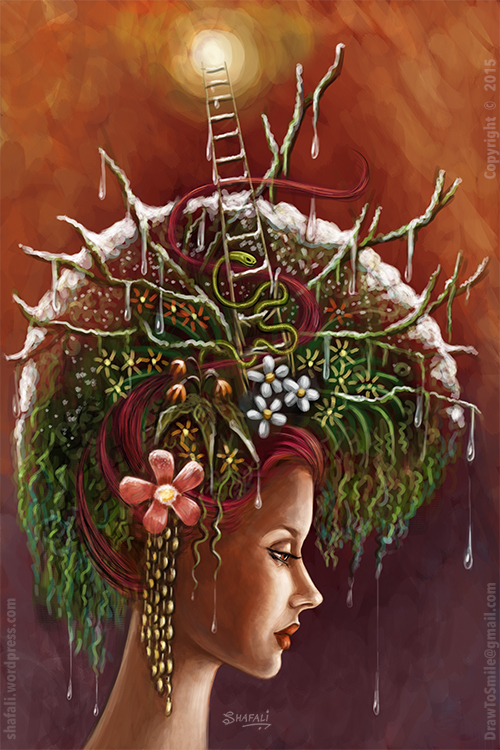 I would start painting a face, expressions would emerge; I’d then read those expressions and paint a hat that told the story of the expression on the face. Artists speak of inspiration, of a portrait that painted itself; illustrators don’t. But within every illustrator lives is an artist. 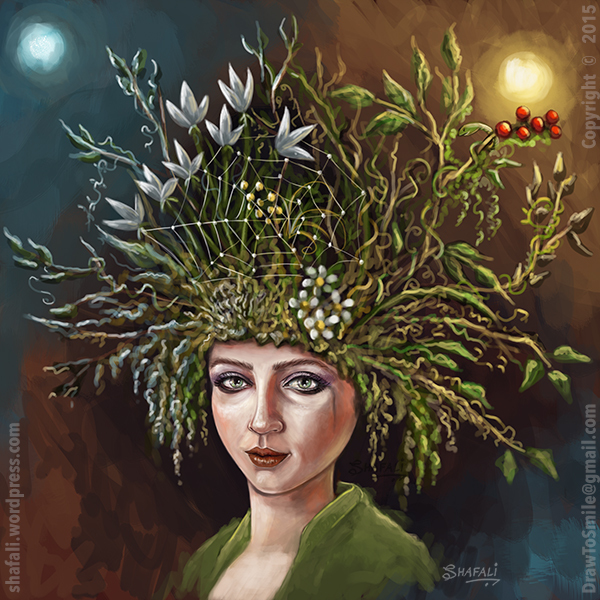 I don’t meet mine very often, but when I do – I paint stuff that’s oddly out-of-place on this blog. For those who haven’t seen the hats yet. The hats happened quite suddenly. Then they stopped. For about three months, I didn’t paint any. Now, I’m painting them again. I can’t explain my behavior. Perhaps you can. 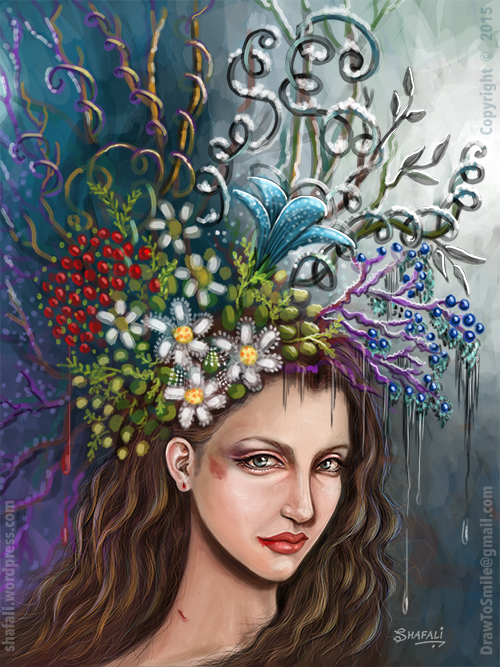 I just know when I must paint them – the why of the hats as well as the inspiration, evades me. 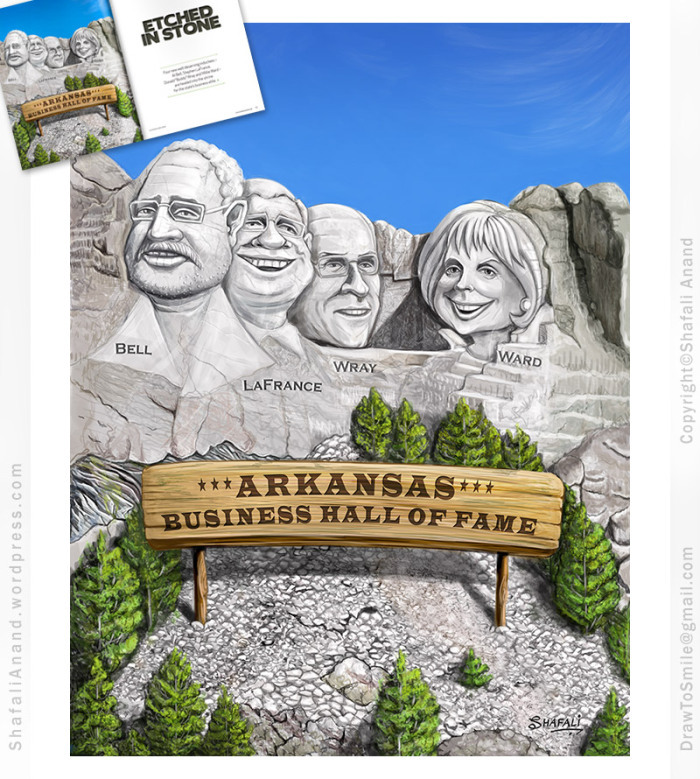 Mount Rushmore Art – Illustrating what the Borglums Sculpted. Mount Rushmore is an odd looking mountain. It’s got four presidential heads so it reminds me of Lord Brahma; it also makes me wonder why George Washington, Thomas Jefferson, Theodore Roosevelt, and Abraham Lincoln made it there while the other Presidents didn’t. This isn’t the only question that makes me itch for an answer. I am also curious why people like to see their faces on the mountain. My research reveals that even Alfredl E. Neuman (the mascot of MAD magazine) has appeared as the fifth face on Mount Rushmore. I expect others to give in to human frailties, but I had always looked up to him – and frankly, never expected this from him. I guess it was the editor of the magazine who decided the cover should show the rocky-face of this funny guy with a missing tooth smiling upon the perfect American family and Alfred had no say in the matter. The commissioning of Mount Rushmore National Memorial was authorized on March 3, 1925. President Coolidge, then President of the United States wanted that two Republicans and one Democrat should accompany George Washington’s face on the mountain. The sculpting began in 1927 and ended in 1941. It was sculpted by Gutzon Borglum and his son Lincoln Borglum. The initial rough sculpting was done using dynamite. At first, they tried sculpting Thomas Jefferson’s face on George Washington’s right, but the stone there wasn’t good, so they moved the face to Washington’s left. 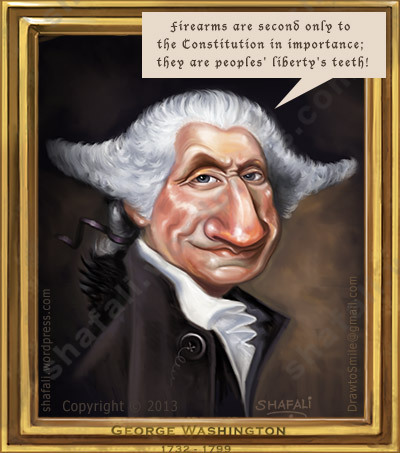 President George Washington – Actual size: 8 inches by 10 inches. Honestly, it was a challenging assignment. 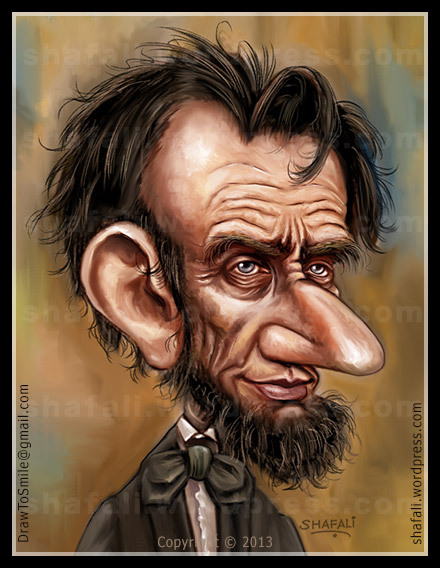 As a portrait/caricature-artist, when you paint faces, you intuitively dip your brush (even your digital brush) into the right colors. The texture you are looking for is skin (for portraits) and skin-nish (for caricatures) and because you’ve painted so many, you know where you are going with it. In this artwork, I had to create the four likenesses in the color and texture of stone. The details had to go, if the Mount Rushmore look were to be maintained. That and everything else, including rest of the stony mountain, the debris left from the dynamiting…was a totally new experience and a challenge that left me with a lot of new learning. 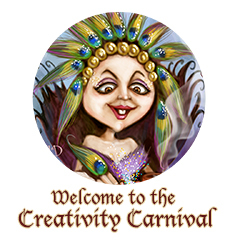 A Creativity Carnival – for Artists, Writers, Poets, and other Oddballs! Friends, I still haven’t decided upon a Feature I’d want to go ahead with, but I did have a Creativity Carnival in mind. Participating bloggers will have a week to make the post. 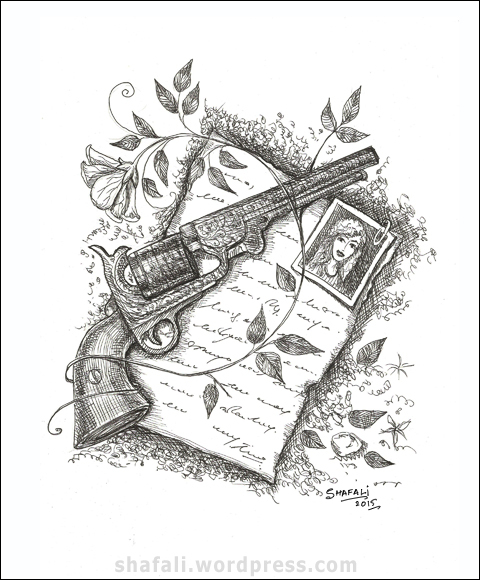 The Pen and Ink Caricature drawing will serve as a cue. 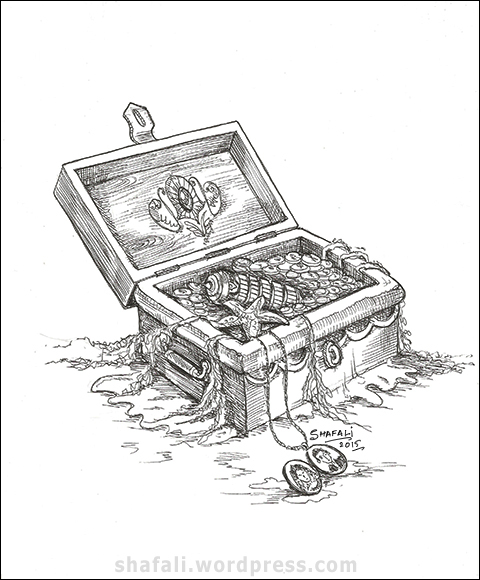 Participating bloggers would be welcome to write a story, an anecdote, a poem, or even draw a picture or post a doodle in response to the cue. 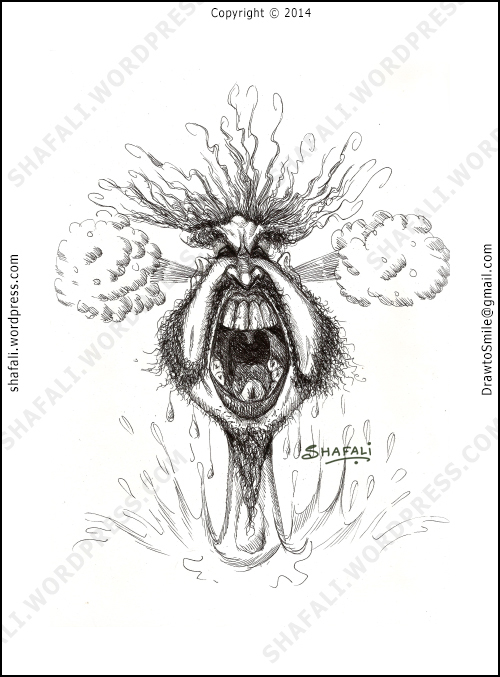 Participating bloggers will integrate the caricature-drawing into their posts. Participating bloggers will provide a ping-back to the carnival post so that other participants can visit their blogs and comment, like, and socialize. Should I, should I not? I had tried it once, but such an event cannot thrive on its own. I looked at the Daily Post event form – and a Creativity Carnival doesn’t fit into any of the given categories. 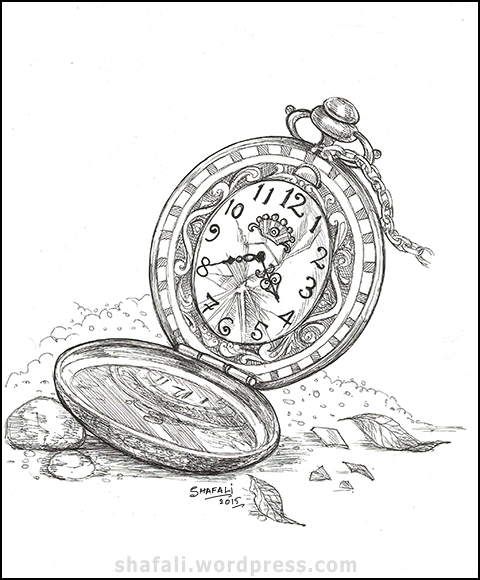 More later – Keep drawing, writing, and smiling! Oh No! My child is an Artist-in-Diapers!! Do read it, especially if you’ve got a little one who dabbles in colors and makes you wonder if he or she is the next Picasso. 5 Childhood Symptoms of an Artist: A Post for the Parents of an Artist-in-Diapers! And a little something to help you overcome your art-addiction. Half and Half make one Half Full – Let the Knights Joust. You may have to look for them, but in a world full of wrong, there are always things that are right. This world is half-and-half, and until I saw this prompt, I didn’t realize that a lot of my illustrations are half-and-half too. 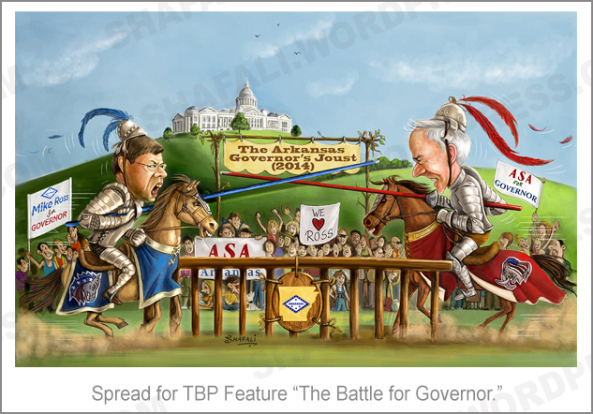 One of these half-and-half illustrations is a two-page spread for the Talk Business and Politics magazine that has Mike Ross and Asa Hutchinson jousting to become the Governor of Arkansas. These two valorous knights galloping towards each other with their lances targeting the other’s chest, hoping to throw the other off his stead, are the reason why this scene exists. The State Capitol building is essential to the scene because forms the quest, but why is the crowd there? The crowd is there because of the two knights. It is there to watch them joust. And this makes me ask questions, that I admit, are totally unexpected of the happy-go-lucky right-brained arty-kinds. Why do we like to see fights? Why, we even make animals fight one another, and wager bets? Why on one hand we cheer the winners and on the other, root for the underdog? What kind of thrill we get from seeing people spill blood or even kill one another? And if we don’t, if we have actually arrived at point in human history where our senses have become more refined and our battles are now fought with arguments, votes, and referendums, why still wars continue to rage through out the world? I think there aren’t any answers to these questions, but we have opinions – and our opinions matter. They matter with all two warring-halves of the world – from the smallest halves to the biggest halves. Our opinions matter when we can influence the two halves and help them stand on the same side of the picture so we can help them become one. Our opinions also matter in bigger issues too as we can influence the course of history by voting the right decision-makers to the top-office of our country. Until that happens, let the knights joust and the pugilists box. 115 F, a blistered finger, and feeling blessed. The middle of an Indian summer isn’t exactly paradise. During the two months of May and June, the fire of hell escapes from the belly of earth and smothers us with a blanket of hot air that scalds the lungs and burns the skin. The afternoon temperature hovers between 110 and 120 F – the computers heat up, and so does my direct-to-screen drawing tablet. In the middle of all this, I find myself working on an urgent assignment that, as I will later discover, to work from 6 in the morning to 7 in the evening. I wake up, ready to go to work, hoping that I’ll be able to use the air-conditioning for those few hellish hours of the day; and then the unthinkable happens. Right at 5 AM, the power goes off! while the heat hasn’t begun to show its true colors yet, I am devastated! As I try to introspect and reschedule my work to afternoon, wondering if sending the files to the client in the middle of the night would make any sense; I see a tiny speck of hope. “It’s a planned power-cut of 6 hours,” said the official newspaper reader of the house who is also my organized-to-a-fault much better half. So I decide to work until the power-backup exhausted itself. No Air-conditioning – aircons are power-hogs and they aren’t plugged-in to the backup. Without the air-conditioning, my Cintiq heats up and starts scorching my fingers. A small selfish part of me keeps praying for the backup to die. It would cut this torture short and give me a temporary respite. It doesn’t happen. The tablet continues to heat up…the air around keeps pace. The power comes back on 30 minutes earlier than expected. Awesome! A quick breakfast and I am back to work. And then it hits me. The artwork that I was working on was complex and it would take me a very long time to finish it. Especially if I took all those breaks that the Doctor advised. So I do the unthinkable – with my fingers crossed, I take my chances. I decide to work non-stop (except for the loo-breaks) until I am done with my work. I am hopeful that I’d be done by 4 PM. I strike gold – finish the sketch on time – but with an angry red boil on the side of my little finger. I should’ve been happy that it was done – I should’ve given my tired me a break from work, but I couldn’t. All through the day, I was nagged by the thought that a part of the concept didn’t appear convincing…and I had to handle it somehow. What the client wants is something that you must create, but what your conscience suggests is something that you mustn’t ignore. 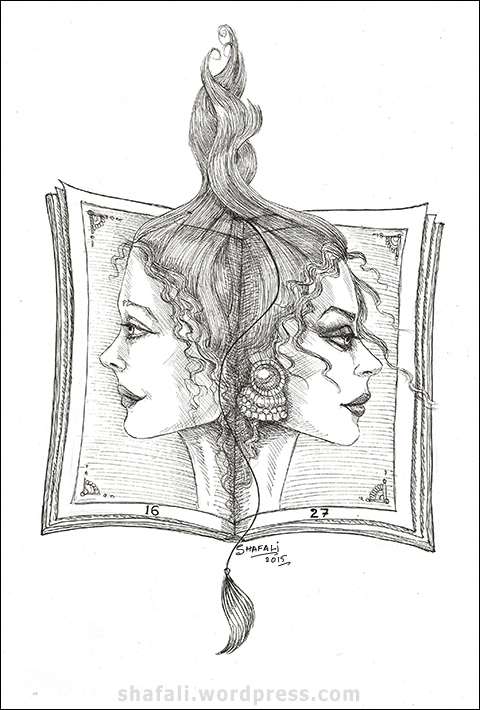 So I return to my art-mate, sketching furiously – creating an option that would take out the thorn from me side. Providing a possible alternate to something that I feel may potentially harm the client, is my job – or so I think. All that extra work – Not pragmatic? Perhaps…but it leaves me more at peace with myself. So I work three extra hours and upload the sketches by 7 PM. Right now, I am feeling blessed. Frazzled but blessed. Women wear different hats for different occasions and at different ages. The hats also change form on the basis of what society expects from them at a particular forum. The hats that I paint are the ones that women wear inside, those that are made of the thoughts that crowd a woman’s mind – some of these thoughts are fearsome, others delightful; some are crazy enough to border on the loony, others are balanced and rational; a few of these thoughts must arise to meet the challenges that life throws upon the thinker, and many that are woven with the threads of the wearer’s dreams. I leave the interpretation to my visitors as our past experiences could help each one of us interpret this hat differently. Does this hat belong to you? or to someone you think you know well? If it does…you are right, because women don different hats at different stages and phases of their lives, and many of us have worn this hat too – not very willingly though. The hats are still torturing me. They make me paint them…they steal my hours and my days, the time that must go into more productive affairs – and yet there isn’t much that I can do, except do their bidding.